My mouse stopped working the other day. No big deal. Right? But I spend at least 4 hours a day typing and clicking. Whether it’s writing for this blog, researching or just responding to emails, I click, roll, zoom and drag a lot. Fortunately, I didn’t let the dumb broken mouse stop me. This time it was my mouse but, in life, little obstacles come up that try to stop you from what you need to be doing. They’re not show stoppers, but they are annoying. And sometimes they are just the excuse you are looking for to give up. "When I get fit, then I will really focus on my technique." "It's too late to start now, I will do it another day." "I am too old/young/tall/short/heavy/light to <fill in task to be avoided here>." Do these sound familiar? Each time, some little "thing" is used as an excuse to not try or do something. The Teddy Roosevelt quote strips away every excuse you have for not doing something. You don’t have to wait for anything. As a coach, I use this quote to motivate myself to ensure that the training program that I deliver, not only has an overall goal of improvement, but that it also directs the fitness and power my paddlers have NOW into moving the boat forward efficiently NOW. You don’t need to be super fit now. You don’t need to have the best technique now. You don’t need to have awesome power now. 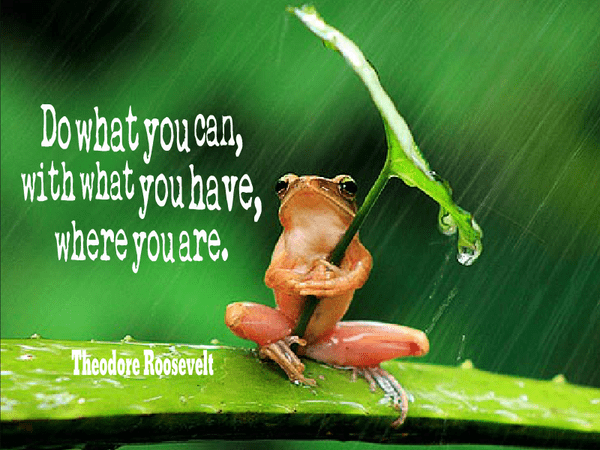 You just need to do what you can, with what you have, where you are. You DO need to know where your weaknesses are so that you can work on them. It may be more fitness, more technique work, better timing, etc. But these will always be on the list. Even paddlers with 10 years of experience are still tweaking these things. Be present at training, listen to your coach, execute the drills and exercises; and these things will look after themselves. But remember: You are paddling NOW. You are racing NOW. We need you NOW. Use your current fitness, your best technique, your best timing, your power and your team work to move the boat forward quickly NOW. Dragon boating is a journey and we are all at different points along that path. If we ensure that we are delivering everything we have TODAY while move along this path of learning, then you can honestly say that you are the best you can be - TODAY. This is a concept we will need to focus on this season as the 10/10 rule will be in place at competitions this season. We will be competing sometimes with only 16 or 17 seats filled! Need to do more recruitment to be competitive!